← Ain’t the TeeVees Great? The Washington Post sure has the world of skating covered this weekend. Katie Carrera is managing things in Raleigh for the NHL All-Star Game, and her colleague Amy Shipley, is 90 miles west in Greensboro, covering the U.S. Figure Skating Championships. Top atheletes are at each venue and the differences are every bit as stark as one would imagine. The draft last night was an amusing, if not corny and awkward ninety minute affair that could’ve been completed in half that time. A good sixty minutes of that presentation featured Alex texting, tweeting and maybe playing Angry Birds. There weren’t nearly enough Caps selected for the game and John Carlson’s absence from the rookie roster really stood out. Across the state, All-Stars of a different breed were racking up points. 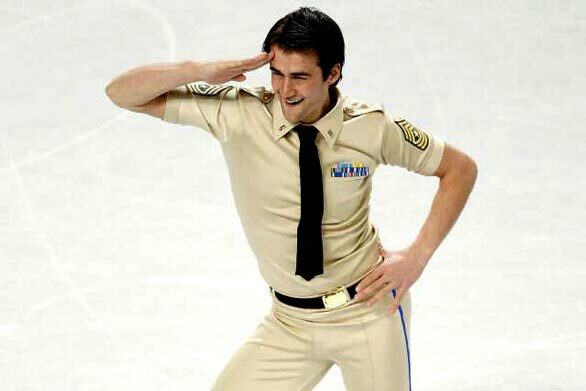 Seen here, wrapping up his short program, Ryan Bradley skated to Boogie Woogie Bugle Boy, ending it with a salute to the audience. Bradley took a narrow lead over two-time defending US champion, Jeremy Abbott, but his outfit got most of the attention. So much in fact, we think that Johnny Weir even felt a little embarrassed for his sport yesterday. And given the military look, we might be starting to rethink this whole DADT repeal thing. All told, we’d rather be in Raleigh, and when it comes to Bradley boys, make ours Matt. 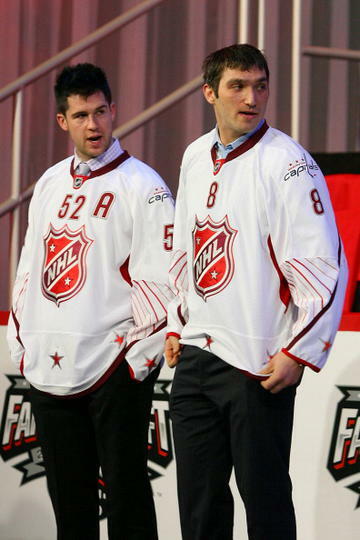 This entry was posted in Uncategorized and tagged All Star Game, Andrews Sisters, men should not wear tight costumes, The Divine Miss M. Bookmark the permalink.